We're saving the planet and making your life easier by offering our Heartland customers the ability to complete some documentation electronically. We have partnered with a 3rd Party, "DocuSign™", to enable you to complete some Heartland documentation such as loan agreements, online without the need to print or scan any paper. Please note we will only accept documents that have been sent from our Heartland DocuSign™ Solution. 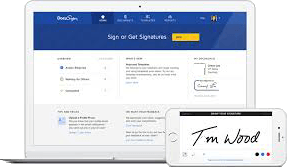 If you have an email address and mobile phone number then you will be eligible to use our DocuSign™ solution. It also means that if multiple people need to sign a document you can do so when suits you – independently or all at the same time. That’s it – we will send you a PDF copy of your completed agreement once all parties have signed. DocuSign™ are Heartland’s chosen 3rd party provider for electronic document execution. We wanted to find a partner with a solution that would be easy to use and help us provide better service to our customers. We chose DocuSign™ as they are a well-established company with a safe and secure solution that was easy for us to roll out to our customers. We take the online security of our customers very seriously and we have chosen our document solution with safety and security of your information as our highest priority.